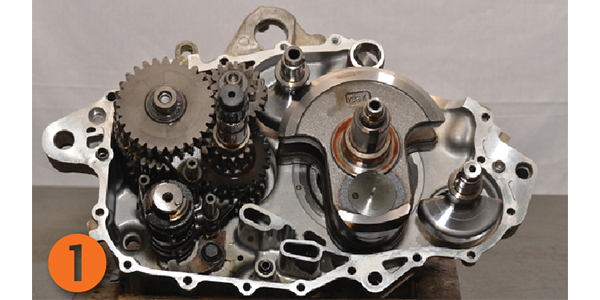 Many Yamaha sport quads use a dry sump oil system. A dry sump system stores engine oil in a remote oil tank instead of a deep crankcase oil sump in a wet sump engine. This makes the crankcase smaller and allows for the engine to be mounted lower in the frame. The disadvantage is a little bit more work when changing the oil. The raptor 660, 700 and older YFZ450 sport quads have an oil tank that sits in front of the engine. To check the oil level in these machines let the engine warm up to operating temperature. Stop the engine and allow it to sit for a few minutes. Check the oil level with the oil tank dipstick. Draining the oil is pretty similar to a wet sump engine except for it will need to be drained from the oil tank and the crankcases. 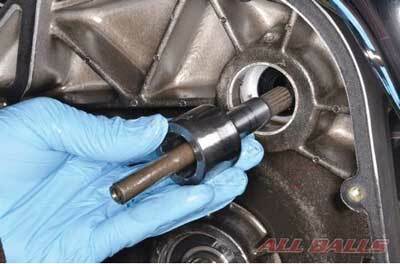 Remove the oil drain bolts and drain the oil from both locations. Replace the sealing washers with new items and tighten the drain bolts to specification. Extra care needs to be taken when filling the oil as dry sump engines can become air locked. If this happens the engine could be starved of oil even though the oil tank is full. This is more likely if the engine has been disconnected from the oil tank or the engine has gone through a major overhaul. Follow the service manual instructions carefully when filling the oil and then check to make sure the engine has oil pressure. 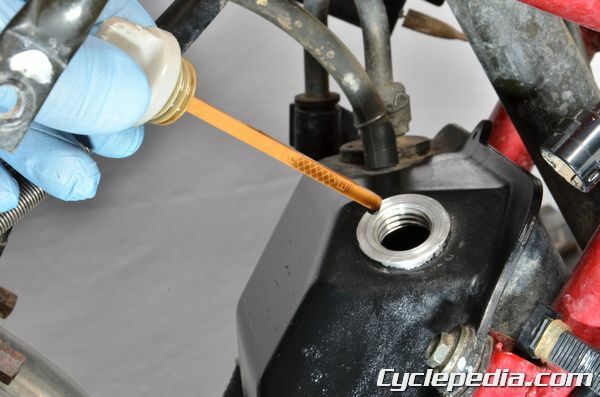 The oil can only be filled at the oil tank dipstick hole on the Raptor 660 models. Fill the engine oil in stages on these machines. Start by filling the tank with 1.85 U.S. qt. (1.75 L). 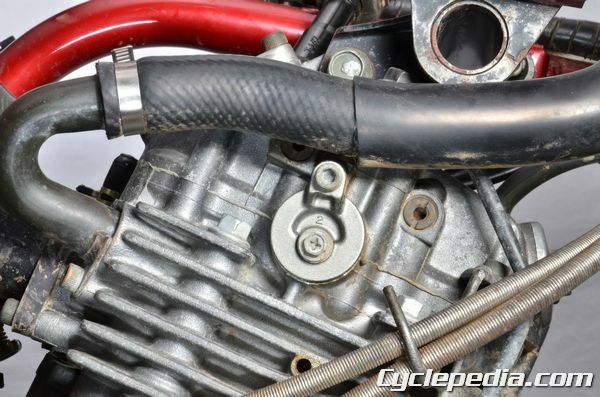 Install the dipstick and run the engine for a couple of seconds and lightly blip the throttle three or four times. Some of this initial oil should have made its way to the engine. Stop the engine and add the remaining oil volume to the oil tank. Check the oil pressure and oil level to make sure everything is good. 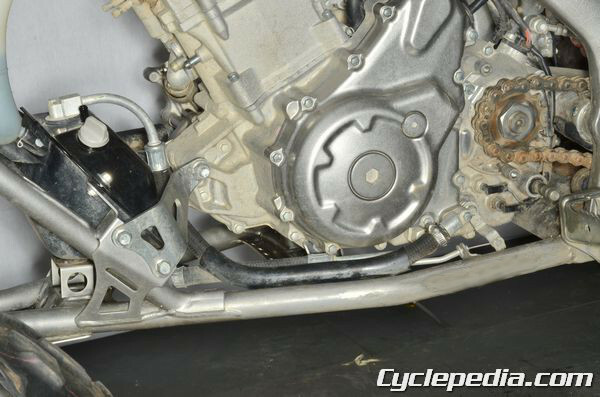 The Raptor 700 also has an oil filler plug on the clutch cover. For these models, fill the oil tank and engine with the specified quantity according to if it is just an oil change, oil and filter change, or if the engine is brand new or totally dry after a rebuild. Even with the extra filler, opening these engines can still suffer from air locking. Check the oil pressure and level after filling. The older style YFZ450 models are similar to the Raptor 700 engine in that they have drain and filler plugs on the engine and oil tank. The newer style YFZ450R quads are semi-dry sump. Their oil sump is built into the front left of the engine where the dipstick sits. The 2010 and newer YZ450F motocross bikes have their oil sump built into the engine where the oil level sight glass is located. Both of these newer-style engines have separate oil drain plugs for the sump and crankcase, but only one fill location. They still have oil pressure check bolts on the heads that should be used after filling the oil. Yamaha provides oil pressure check bolts on its dry sump models. The check bolts are located on the right side of the cylinder head. Start the engine and watch for oil to seep from the check bolt. Oil should appear within seconds. Stop the engine if no oil has appeared after 30 seconds from engine start up. It may be necessary to temporarily loosen the oil filter or an oil line to bleed the air from the system. The lubrication system should be inspected if the oil pressure won’t build. 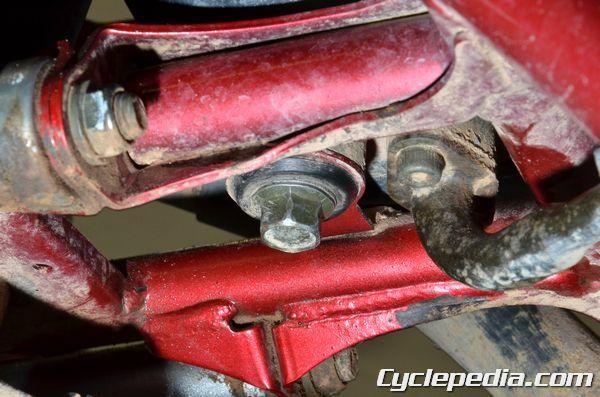 Other manufacturers with a dry sump may have a check bolt as well or require you to crack loose an oil pipe bolt or leave the oil filter loose until oil appears. Always check a dry sump engine for oil pressure after a fill and double check the oil level after running the engine. The extra time it takes to check for proper oil circulation is nothing compared to repairing damage from poor lubrication. For more information about Cyclepedia manuals and professional products, visit www.cyclepedia.com.